When we connect to our lives through psychic readings, we find clarity and are infused with the power necessary to choose the direction of our lives. When people can relax physically what follows is emotional, mental and spiritual relaxation, leading to the balance required for a healthy and meaningful life. Reiki is a powerful self-healing tool that can be used for self and others to balance our physical, mental, emotional and spiritual selves to bring about peace in a chaotic world. I'm in! Sign me up for the Intuitive Development Class! I'm in! Save my spot in the Reiki Class! ~ Tune In and Tune Up Thursdays with Erin Lee. It's on at 7 PM PT (Vancouver, BC, Canada - click here for a time zone converter). We start off with a brief talk about a relevant theme that has come up in over the week, and then I offer mini readings to people who are live on the show. It has been SO MUCH FUN, and a joy and honour to share with everyone who joins in. It's free to watch and ask questions. Please join in the fun, it would be wonderful to see you there! I've recently launched a new, online scheduling website - www.BookingWithErin.com to make booking an appointment faster and easier for everyone. Simply visit www.BookingWithErin.com, choose the In Person Calendar, or Phone or Skype Calendar, set your time zone and choose your session, date and time. It's quick and easy and allows me to concentrate on what's really important - YOU! Please note that ALL appointments are now booked online. Thank you. March of 2015, www.CrowdWellness.com came out with an amazing list of the Top 25 Psychics in Vancouver. I'm honoured to have been included and recognized on their list in 2015, 2016 and 2017. To see the rest of the amazing lightworkers, and other holistic and healing practitioners, check out www.CrowdWellness.com. ~ Welcome to the Journey! A special thank you to Simone of CreativeSimone.com, for the amazing ocean photos seen throughout the HeavenLee Messenger website. 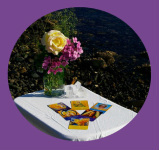 All of the photos were taken at my Ocean Front Studio in Union Bay, on Vancouver Island, BC. During the cooler months, appointments are inside with the water feet away, and during the warmer months, an outdoor option, feet from the ocean, is also available. HeavenLee Messenger, Copyright 2011-2014, Erin Lee.